Gardening is one of the activities around the home that is both pleasurable and rewarding. It gives every gardener immense joy to watch the garden plants boom in the spring. The green, the luster, and the pleasant smell evokes feelings that are hard to describe. But achieving such a perfect garden requires more than a little hard work. The gardener needs to invest money, efforts, and time if the dream of a perfect garden is to be realized. Among these investments, time appears to be the most luxurious and it is the reason why many prospective gardeners are still sitting on the fence. What if you could have that perfect garden you’ve always dreamed of without having to spend much time tending the garden? Modern technology has the perfect answer to this question. Automating your garden allows you to delegate many of the routine gardening tasks to machines. Invariably, you would need to spend much less time on your garden and the tasks would still be carried out effectively. Here are some ways through which you can automate your garden. An automated sprinkler system takes the stress of watering your lawn. 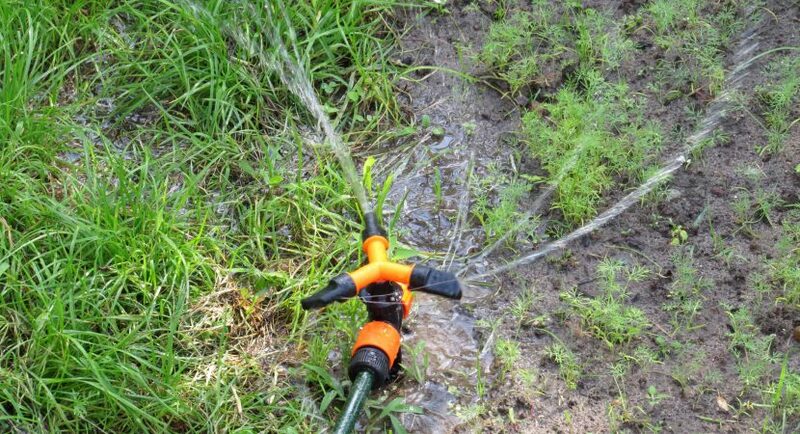 You do not need to think about getting wet while trying to channel the watering hose to the roots of your plants. The sprinkler effectively takes care of this problem. Automatic sprinklers are built to rise from your lawn when activated and sink back again once your garden is fully watered. This ensures they do not interfere with mowing especially if you are automating that too. Smart sprinklers are great for watering lawns but not watering individual garden plants. Watering your plants is essential if you want a green, luster garden. The only problem is that the process of effective watering appears quite complicated and it’s easy for a gardener to second guess if he/she is doing it right. There are many tips you would have come across and following all of them would seem almost impossible. With a smart irrigation system, you can effectively water your garden while literally doing nothing. The irrigation system is built too channel water directly to the roots of the plants and it could save you as much as 50% on your water bills. A smart irrigation system is also capable of telling you when you need to water your plants by using information from past, present, and forecasted weather conditions. And you do not have to be around before you water your plants because the system can be automated or controlled from your smartphone. Lawn mowing is one of the tasks that make your garden aesthetically pleasing. At the same time, it could be time-consuming and for many gardeners, it isn’t exactly enjoyable. The automatic lawn mower is around to save the day if you aren’t exactly a fan of lawn mowing. The automatic lawnmower is essentially a robot that is able to redirect itself when it encounters an obstacle. The robot makes random movements on the lawn and cuts down every blade of grass it comes across. An automatic lawn mower can take care of grasses with short and long blades. The main issues you could have with the robot is setting it up to mow your garden and the price. Setting it up may require burying some wires around your garden and it may take some time. And it costs well over $1000 on the average. But if you have the money, it’s one gardening chore off your list, for good. Early diagnosis appears to be a crucial factor in the treatment of both human and plant diseases. But diagnosing a plant disease early isn’t very easy. Before the plants start presenting visible signs, the disease would already be in the advanced stage and the death of the plant is almost inevitable. There are plant sensors that could measure the amount of sunlight energy the plant absorbs. If the weather conditions remain the same and a particular plant isn’t absorbing enough energy, the sensor can help you identify that plant. You would then need to make a decision on what to do with the plant. If the disease is yet to spread to other plants, killing one plant to save your garden would be a sensible sacrifice. Some automated garden sensors are designed to measure vital environmental conditions that affect plant growth such as soil moisture, ambient temperature, amount of sunlight, and more. These sensors compare this information with the standard conditions that are necessary for the plants to grow. The sensors are especially useful for fastidious plants that die quickly under environmental conditions that are only slightly unfavorable. If your garden is persistently disturbed by large pets such as raccoons, rodents or deers, an automated garden drone that is specially designed to control such pests is recommended. The drone is equipped with motion sensors that are capable of detecting unwanted movements. Once the movement is detected, the drone flies around a pre-determined trajectory to scare away these animals. After some time, it flies back to its recharging station but you can be sure the animals would have moved away from your garden by then. Some people are of the opinion that gardening as a pastime should remain physical. They believe that all these automated gardening techniques take most of the benefits out of gardening, and also the fun too. While there is hardly any technological invention that was embraced by everyone, it can easily be argued that the argument above is defective. To start with, automated gardening techniques ensures most gardening activities are done correctly. The smart irrigation system is a classic example. You would be providing adequate water for your plants, preventing plant diseases that could arise due to wet shoot systems, and still save as much as 50% on your water bills. Perhaps the best thing about these automated systems is that they give you the power of choice. Your smart garden doesn’t have to incorporate all the systems. You can easily select the gardening activities you love and keep doing them yourself. And if there is anyone that is becoming too much of a burden, you could automate it to save you valuable time, and perhaps money.